Mom's Gone Bronson! : LEAP! DVD and Meal Passes for Ovation Brands GIVEAWAY! LEAP! DVD and Meal Passes for Ovation Brands GIVEAWAY! Here is a new giveaway in partnership with Ovation Brands (Old Country Buffet, Ryan's, Hometown Buffer, Country Buffet AND Furr's Fresh Buffet. To celebrate the lovely movie LEAP! - a movie about Félicie and Victor - 2 best friends who plan an escape from a french orphanage to chase their dreams of becoming a dancer/ballerina (Félicie) and a brain-powered inventor (Victor). November 2 – Bonjour, Family Night! Every THURSDAY from 2nd November until 7th December between 5pm-8pm you can find fun kids activities that will inspire, educate and entertain children in participating Ovation Brands' establishments. PLUS, just so you know, and don't miss out - kids eat for just $1.99 from 4 p.m. until close with the purchase of a regular-priced adult (or senior) meal. What a great way to get the family together! 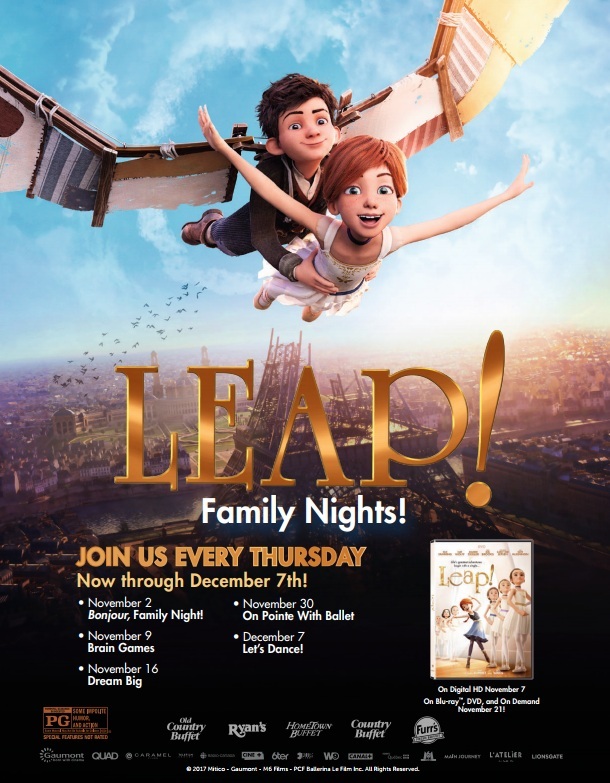 Ovation Brands' would like to offer ONE of our readers a prize package to celebrate this series of entertainment with FOUR (4) meal passes to use at Ovation Brands' locations, as well as a LEAP! DVD to keep the fun alive at home! All you have to do to be in with a chance of winning this prize package is enter via the raffle copter, below. All entries are considered and 1 winner will be picked at random on November 29th 2017. Winners are notified via email so please do sign up with a valid email address - we will not use your email for any other purpose than to communicate with you about your prize. Entrants must be 18 or over to be eligible, or have parents permission and must reside in the U.S.A. I would take my wife and two boys to Hometown Buffet for a family night out! I commented on the post "What to Consider when Buying Your Next Car". I would probably take my husband and my kids for a nice buffet. I would take my husband and girls. I would take my boyfriend and our kids. me and my little boy. He is my life. I am single mom and very proud of it!! He is a smart strong little boy and deserves so much !! The one person I would have to have no matter what would be my father who has loved the Old Country Buffet ever since I was young!